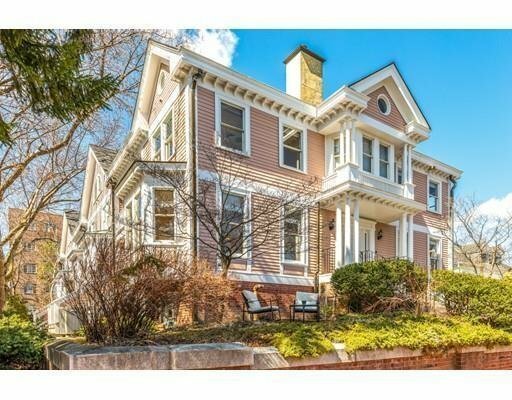 High atop a hill, overlooking one of the most picturesque streets in Cambridge, lined up with Italianate and 2nd Empire houses, this handsome 4 bed 3.5 bath townhome, rebuilt in 1987, is bathed with sunlight and enjoys exceptional views of Boston and its beautiful surroundings. The open plan living is framed by rows of windows and adorned with a gas fireplace and built-in bookcases. The designer?? ?s kitchen has high grade appliances and a peninsula for breakfast. The dining area has wet bar with wine cooler and a deck to enjoy sunset hours outdoor. 2nd floor hosts 2 bedrooms 2 baths. The master suite has built-in walk-in closet, private deck and a peaceful four piece bathroom with double sink and free standing tub. The 3rd floor has 2 rooms with cathedral ceilings, cedar closets, pretty nooks and many skylights. Side entry level has pair/guest suite and garage access. Walking distance to Harvard, Inman and Central.